Wal-Mart’s business has been built on one major principle: “always low prices.”Company executives often refer to the company’s position as a “price leader” in interviews and news releases. And Wal-Mart’s recent ad campaign is based around a “low-price guarantee” and touts the advantages of shopping there over K-Mart, Target, and Best Buy. Despite protests over supply chain concerns like a recent fire in a Bangladesh factory and low employee wages, most people who shop there say they do because it’s the cheapest. So is Wal-Mart really that much cheaper than competitors? Competitor Target’s prices are actually cheaper on average, according to an August study by Bloomberg Industries. The study found that a shopper would save 46 cents for every hundred dollars by shopping at Target instead of Wal-Mart. Other consumer studies from places ranging from New Jersey to Dallas showed that deep discounters (like Aldi and Save-A-Lot) and local grocers had better prices than Wal-Mart. Blogger CouponSherpa compared prices for 71 common grocery products in 2011. She found that competitors like Kroger and Target often had more reasonable prices. The reality about Wal-Mart’s pricing could put into context leaked emails reported by Bloomberg last week that caused an uproar. “Well, we just had one of those weeks here at Walmart U.S. Where are all the customers? And where’s their money?” one executive said in an email. The emails also said that February sales so far have been a “total disaster” and the worst start to a sales month in seven years. While it’s easy to jump to the conclusion that Wal-Mart’s problems spell out greater doom for the economy, it’s also possible that it’s just losing out to competitors, as Brad Plumer at The Washington Post reported. While the company will price-match to a lower ad, unless the prices are lower, many shoppers don’t have the same incentive to do business with Wal-Mart. If the competition has the same or better prices, Wal-Mart is at a disadvantage. Wal-Mart pointed us to more recent studies by USA Today and NBC New York showing that its prices are lower than grocery stores and other competitors. 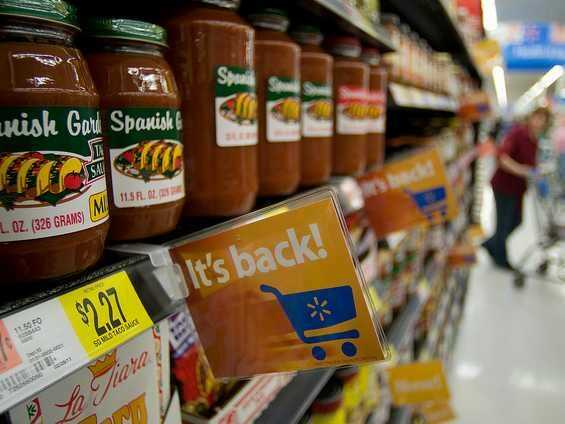 “More recent studies demonstrate Wal-Mart’s price leadership. These reiterate that Wal-Mart is the everyday low price leader and that our customers don’t have to wait for a sale or look for an ad,” a spokeswoman told us.